Because of their limited, or otherwise lack of professional experience, evaluating on-the-job skills of recent graduates can be a bit of a challenging. 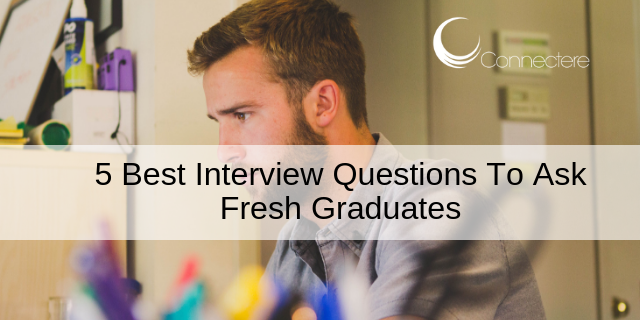 What you can do is direct your interviews with fresh graduates to evaluate their communication, problem-solving and time-management skills. Outside of common “tell us about yourself “and “what are your strengths and weaknesses,” the following questions are structured to help you do exactly that. 1. What interests you about this role? This question provides an opportunity for the candidates to show you they have an understanding of the specifics of the role they are applying for. What specifically caught their attention about the advertised job? Based on their response, you will be able to separate candidates who gave proper thought before applying from those who sent in their application just because they could. 2. How do you think your college education and experiences have prepared you for this Role and a career in this field? This question will help you assess whether the candidate has been able to make a practical connection between the theory of their academic studies in school and real life application of that theory in the workplace.Candidates can talk about how their coursework helped them to work on projects as part of a team or on their own. The same goes for how their education helped them execute of their duties during internships and at a previous job(s), if any. 3. What are your long-term career goals and how does this job fit into that plan? Ask about where the candidates sees themselves professionally in the next couple of years. If a candidate’s career goals don’t quite match with the job description for the role you are interviewing for, then chances are they won’t be around for long. Being so young and inexperienced, recent graduates will always be on the lookout for jobs in their field of interest, even if that means changing jobs every so often. This question is very open-ended and the candidates can pick from group assignments and projects, to a time during their internship. The candidate can describe their role in the group and what skills they have that helped them deliver on their assigned duties.You can also follow up by asking about any challenges they faced during this time, how they dealt with the challenges, and what lessons, if any, they learnt from the situation. 5. If offered the job, what contribution do you expect to bring to the company? This question will help you assess just how much a candidate knows about your company and if they understand the specific value they can add. If a candidate is familiar with your company’s mission and specific needs, then they can easily identify how their education, skills and experience can help them make a worthwhile contribution in meeting the company’s goals. It gives the candidates a chance to share what they have to offer and how much of an asset they can be for your company.